2 large ripe bananas, mashed. 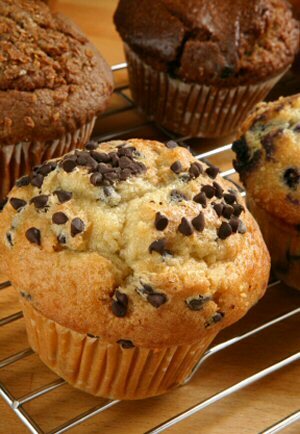 Preheat your oven to 400°F (200°C) and grease 12 standard size muffin-pan cups. Beat together the butter and granulated sugar until light and fluffy. One at a time, add the eggs, beating thoroughly after each is added. Beat in the bananas until the mixture is smooth. Mix together the flour, salt, baking powder and baking soda. Alternately stir the flour mixture and the buttermilk into egg mixture until the dry ingredients are just moistened. Stir in the chopped pecans and vanilla extract. Spoon the batter into the greased muffin pans, filling about two-thirds. Bake for around 20 minutes or until golden brown.